(after he, Bagheera and Mowgli escape from King Louie and company) Whew! (laughs) Man, that's what I call a swinging party! (as he and Mowgli float down a river) Let me tell you something, little britches: if you act like that bee--uh-uh, you're working too hard. And don't spend your time looking around…for something you want that can't be found. Bagheera: Oh, no, it's Baloo, that shiftless, stupid jungle bum. Buzzie: Hey, Flaps, So what we were going to do? Buzzie: Look, Flaps, first I say, "What were going to do?" Then you say, "I don't know. What'cha wanna do?" Then I say, "What we're going to do?" Then you say, "What'cha wanna do?" Let's do something! Mowgli: Bagheera... (yawning) I'm getting a little sleepy. Shouldn't we start back home? Bagheera: Mowgli, this time we're not going back. I'm taking you to a man-village. Bagheera: He hates man. And Shere Khan is not going to allow you to grow up to become a man--just another hunter with a gun. Mowgli: Aw, we'll just explain to him that I'd never do a thing like that. Bagheera: Now, that's enough! We'll spend the night here, things will look better in the morning. Kaa: Just you wait till I get you in my coils... Uhhh! Mowgli (laughing): Bagheera, he's got a knot in his tail! Kaa (mimicking): “He's got a knot in his tail!” [He grunts, struggling free from forked shoots; as he does so, his entire skin crashes at him like an accordion. He then slithers away, moaning] This is going to slow down my s-s-s-slithering. Elephant #1: I'm putting in for a transfer to another herd. Col. Hathi (looking closely at a recruit's trunk): Tsk, tsk, tsk. A dusty muzzle. :(to elephant in question) Soldier, remember: in battle, that trunk can save your life. (taps trunk with cane) Take good care of it, my man. 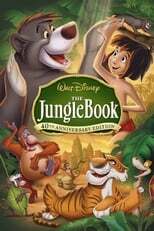 Mowgli: It's not your jungle! Mowgli: Bagheera, what's the matter with him? Bagheera: You've got to be brave, like Baloo was. Mowgli: Y-you don't mean... Oh, no. Baloo. Baloo (sniffling): He's cracking me up. Bagheera: The memory of Baloo's sacrifice and bravery will forever be engraved on our saddened hearts. Bagheera: This spot where Baloo fell will always be a hallowed place in the jungle, for there lies one of nature's noblest creatures. Baloo (still sniffling): I wish my mother could have heard this. Bagheera: It's best we leave now. Come along, man-cub. Baloo: ... Hey, Baggy-buddy, you were doing great! Tell us more! Lots more! Bagheera: (sees Baloo still alive) WHY, YOU... BIG... FRAUD!! Bagheera: Ah, it was inevitable, Baloo. The boy couldn't help himself. It was bound to happen. Mowgli is where he belongs now. Baloo: Yeah. I guess you're right. But I still think he'd have made one swell bear. Baloo: A word? You gonna talk some more? Baloo: All right! What's up Bagheera? Bagheera: Baloo, the man cub must go back to the man-village, the jungle is not the place for him. Baloo:Yeah, It's beautiful ain't it. Bagheera: D'oh! (Bagheera clears his throat) Baloo, you can't adopt Mowgli as your son. Bagheera: Uh.. How can I put it? Baloo: Oh, stop worrying, Baggy! Stop worrying I'll take care of him. Bagheera: Yes, like you did when the monkeys kidnapped him huh? Bagheera: Not in the jungle! And another thing: Sooner or later Mowgli will meet Shere Khan. Baloo: The tiger? What's he got against the kid? Baloo: But, little Mowgli don't have those things. Bagheera: Shere Khan won't wait until he does. He'll get Mowgli while he's young and helpless just one swipe. Bagheera: Well, do what's best for the boy. Baloo: Are you outta you're mind? I promised him, he can stay here in the jungle with me! Bagheera: Well, that's just the point. As long as he remains with you, he's in danger. So it's up to you. Bagheera: B-b-because he won't listen to me. Baloo: I love that kid. I love him like he was my own cub! Bagheera: Then, think of what's best for Mowgli and not yourself! Baloo: Well c... Well can't I wait until morning? Bagheera: Stop! Wait a minute... HALT!!!!! Col. Hathi: Who said "halt"? I give the commands around here. Both (singing) I mean the Bare Necessities are Mother Nature's recipes that bring the Bare Necessities of life. [Mowgli looks at Kaa for a moment, sticks out his tongue at Kaa, and looks away] What have we here? [Kaa turns his head to face Mowgli's face]... it's a man-cub.